As a Scrum Master I took care of a new Team where I wanted to have a better visualization of our daily work. As I am not a big fan of digital tools for processes I decided to set up a physical board although it was a distributed team. 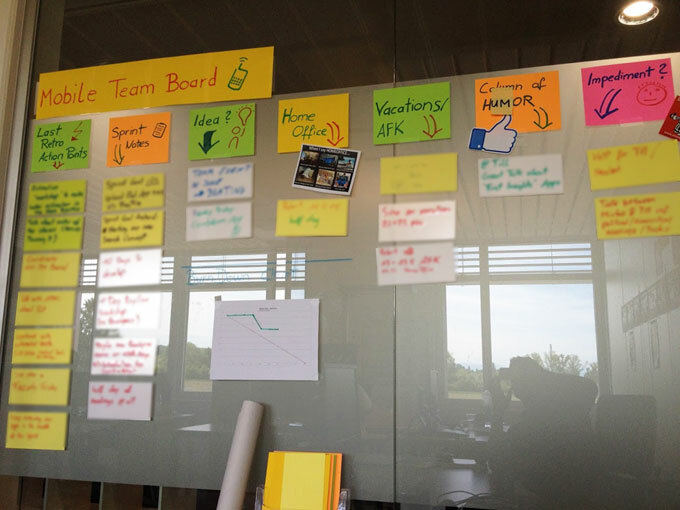 As we where a Scrum Team we were doing Retrospectives where we got out a bunch of actions points. Some of them weren’t that personal, more related to team efficiency. In order to not forget these points I put this column as the first one. In order to plan a good and realistic Sprint all upcoming issues should be clear and communicated. This column helped us a lot while we were planning our next iteration. So we wrote down our Sprint Goals, How many days we have for that sprint (think about bank holidays and workshops) and other stuff. If an idea popped up at any time we wanted to have a space to save it. So this board was the perfect space for that in order to not forget it. 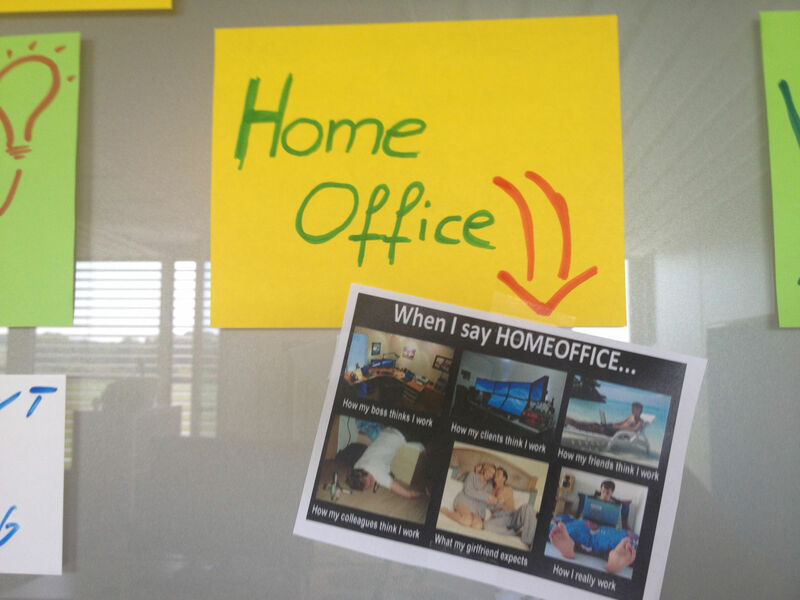 Will somebody be on Home Office? This information can be helpful if you plan to take an important decision in the Sprint or if a new potential employee will be visiting us. So if the team knows that a little bit in advance it helped us to get things organized better. If somebody is planning vacations or just will be AFK (Away From Keyboard – Conferences, internal courses etc) then we had the complete overview. You can avoid questions and confusion of absence. 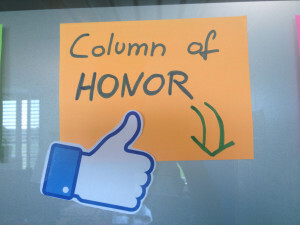 For what qualities do you honor your colleagues? If somebody was doing something awesome, very cool or just making a good job, why not mention that in a transparent and public way? Every person likes to be honored for something he/she did good. So we found a good place for it! I’ve heard many discussions about the Burn-Down Chart – If it’s really necessary or not. Anyway, if your team is using it because they think it gives them a good orientation and feeling about the running sprint, that board might be a good place for it. I used to work with an Impediment Board but never liked it that much. So the last column was the Impediment column. Remember: Impediments for the team aren’t only for the Scrum Master, it’s for the whole team in order to make clear that something is making us slower. Any member of the team who feels that can solve the problem can do it! Nobody likes boring boards :) Make it funny, put some funny jokes on the board. Make if alive by just putting cool painted icons on it. Attention in the beginning will just be higher and team members will act just differently in future. I wanted to make it as easy as possible to add new information on the board. So I set up a bunch of markers, Post-It’s and tape – all in different colors directly in front of the board. As I said in the beginning that I am not a big fan of digital solutions for processes I didn’t wanted to set up a tool for this board. It’s just not the same because a physical board is something to touch and what you can see everyday just by entering your office. The “Play” Factor gets lost and people just forget to work with yet another tool in their bookmark list. So in order keep remote members updated, I just take a daily picture of the board and share it in our google plus community as we were doing our daily stand-up with google hangout, they’ll never miss it. If remote members want to share something on the board, they communicate it in the daily or in some moment of the day. People will just put their Post-Its on the wall. Have a look at the board before the daily. Take some notes and mention them before closing the daily session just to clear up the most important topics on the board. If there is nothing new, there is nothing to mention. When the Scrum Master starts to use this board as a helpful tool, chances are good that other members will adapt it. Try to get it into your team if you feel that might be a good solution.